People seem to follow anything just like shepherd commanding their sheep’s. But then there are some lads, some misfits who think the world should behave how they choose to accept it. Google recently removed the menu bar from Chrome which many of us were fond of, and yeah that means I also loved the old way. You could quickly have access to your Google+, YouTube, Google Maps, Google Play, Newsstand, Gmail, Drive, Calendar, etc. But now you have to follow the lengthy method → going to menu grid situated at the top right corner and navigate through those filthy looking icons. Well, to bring you guys out of your misery; I have found two new methods to bring back your traditional black bar. It’s is a cracking way to bring back your Google navigation bar and feed your perfectionist self. Here we are going to edit the Google own URL “www.google.com” Easy there, it’s not any rocket science, just a simple step. You just need to add “?noj=1” to the URL. Paste it in the address bar and, Hola! 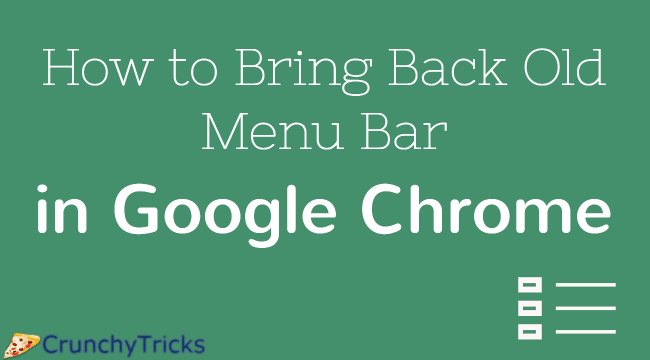 You got your old Google menu bar back just the way it was. If you see an enormous Url and get confused to what should be your next step, wait we got that too. Simply add “&” before “?noj=1”. Now that you have brought back your black menu like a pro. You would be thinking, “What a tedious step, repetitively typing the same thing” I know it’s very annoying, but you can probably fix it. Just save the Google page as a bookmark or make it your homepage, the choice is yours. If you are too afraid to mess with the URL, then we also got another trick for you. Another way is to merely install an “add-on” or extension for Google Chrome. You may not have heard of this app but its there on the internet, helping netizens just like you. Open Chrome web store. For that search for ‘chrome web store’ on Google search engine or you can go directly from here. Type “Proper MenuBar” in the search box on the top left the corner. Click on ‘+ Add to Chrome‘ and thus, adding as an extension. There you go, now you can have that old Google menu bar and relive the classic setting just like it used to be. Click on the “Three dot icon” button on the top right corner, next to the address bar against the bookmark button. Click on More Tools>>Extensions from the Panel on the left. Look for Proper Menubar in the list and uncheck “Enabled” checkbox to disable the extension. To remove the extension from Chrome, click on the “Trash Bin” icon. I believe you should go for the second method, which is adding Proper Menubar extension because it’s very simple and it also has an advantage, over the URL method which is it automatically position itself over all the web pages opened. On the other hand, in the first mode, editing URL for every web page other than Google homepage itself becomes a hassle. Now go, come‘n’ show it your friends apprise them how you believe in beauty and keep some values close to your heart be it anything; preferring PC over a phone or holding to a small detail like this old Google menu bar. Previous articleSerpstat Review: Is It The Best Growth Hacking Suite?